I mean honestly, raise your hand if you're surprised. 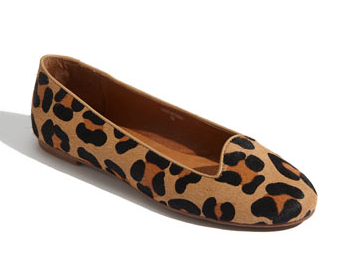 They're leopard, they're flat, and they have that curve at the toe that resembles the shape of my tassel flats. Like a more girly Hugh Hefner slipper. This is also a really good leopard: big, bold and printed on calf hair. I also appreciate the seam around the edges which adds a little definition and polish. These sweet little flats - which I believe to be a must for spring before it gets to warm and a must for fall once it starts to cool off - are just $99.95 at Nordstrom online. If leopard isn't your thing (Who am I kidding it's everyone's thing) they also come in some shades of patent leather. I just may order them right meow. Gimme one in every color!